David Weinberger has been thinking in public again, giving us plenty to chew on. I’m with ‘most everything he says. I had been wondering for a while before I read these remarks, though, about the applicability of spatial metaphors to the Web. I’d been tempted to reject the notion altogether before I read what David has to say about the Web’s “persistence.” He points out that our experience of the Web’s “persistence,” its durable continuity, grounds our perception of the Web as a place — in contrast to such modes of interaction as telephony and ham radio (and he might have added in light of Friday’s talk, instant messaging). That’s a good point, and I hadn’t been thinking in those terms. Still, wonder if our sense of the hyperlinked aspect of the Web (DW’s point #3) doesn’t far outweigh our sense of the Web as an enduring spatial domain. “Space” typically entails “extension” for everyday life; space has dimensions of height, breadth, depth, all of which are absent (or extremely different) with relation to the Web. Our first round of metaphors helped us grasp the notions of linked compositions (hence, a “Web” or a “superhighway”), but the very metaphors that communicate “linking” also imply distance. In physical reality, we need links to connect two remote locations; in the Web, though, our pages are not so much physically far from one another; for all we know, the pages we read and write are being served from the caches of a single server. I’m not about to supply a newly-minted, copyrighted Superior Metaphor. None has come to mind. But one of my concerns as we modulate into the new regime of hyperlinked presence involves the ways our leftover metaphors constrain our behavior under different conditions. Davids’ talk seems to draw on an etymology of “Utopia” as eu-topia, from a Greek compound that would mean “good place” (DW fretted with the possible/impossible extent of “perfection” in the “new” and “fresh” Web), but one might also derive “utopia” from ou-topia, “no place,” and that line of thinking appeals more to me. How might we imagine the Web if we tried to conceive it nonspatially? But If You Study the Heuristics and Logistics of the Mystics. . . .
Mark Woods blogged my dismay at his spotlight on Alex Burns’s paean to Elaine Pagels. Now that I’ve climbed down from my high dudgeon, I ought to re-emphasize a few points, and perhaps clarify a basis for my irritation. First, Elaine Pagels is an outstanding scholar. I agree with her about some things and disagree with her about others, but my pique was directed at Alex Burns,not at her. Second, the responses that Mark obligingly cites from First Things are only somewhat more likely to yield illuminating assessments of Pagels than is disinformation . First Things leans heavily toward a particular (generally conservative) version of Catholic teaching, such that it would be surprising to find a positive review of Pagels’s book there. At least First Things knows something about theology and church history, and they enlisted as a reviewer Jeffrey Burton Russell, a scholar of stature roughly comparable to Pagels. (Some would disagree about that; the point, however, isn’t their precise equality, but the fact that both are widely-known, widely-respected scholars.) Third, and this is the point I wanted to make, Burns fallaciously ascribes to Pagels authority as a spiritual teacher, whereas her studies, credentials, and writings justify her authority as a historian. Historians can be spiritually enlightened, and people with a rep for spirituality can be frauds–but Burns treats her acknowledged brilliance in one field as the basis for a very different sort of authority. Pagels’ magisterial and witty writings reveal an important neuro-political lesson: Salvation must be found from personally mediated truths. Heed her call and remember. Always. Okay, some premises: First, Elaine Pagels is way, way smart, and has lived gracefully through intense heartbreak. Second, orthodox Christians have involved themselves in rotten things like the excesses of the Crusades and the Inquisition. Third, Christians have consistently beaten up on Judaism, for a variety of (bad) reasons. Second, Burns makes of her a martyr-prophet, opposed by the clerical villains while the historically-sensitive masses shake off their shackles to the bloody juggernaut of orthodox Christianity. Observe, though, that Burns offers no reason for anyone to assent to Pagels’s premises or his romantic battle-cry of spiritual autonomy. Personal tragedy doesn’t authenticate historical arguments (or spiritual counsel), though, and Pagels’s life has not been utterly blighted by her harrowing losses of the mid-eighties (she’s married again, she has several lovely children, she’s a tremendously successful author and speaker, all without trading in her scholarly standing or the appreciative respect of those of her students whom I’ve known). Few of the dissenters to her theses fit Burns’s picture of scheming reactionaries. If the reading public that she attracts worries a lot about Christianity’s historic iniquities, they are more attentive to the church’s failings than to any other cultural institution’s. She has not, so far as I know, repudiated Christian faith; we used to attend the same church in Princeton, and she has been a regular visitor to the Cistercian monastery in Snowmass, Colorado. None of that stops Burns from concluding with the pompous, “Heed her call [to seek salvation in personally-mediated truths] and remember. Always.” Why? First, why Pagels? Then, why “always remember”? One can put together a reasonable argument for the kind of personal-mysticism spirituality that he espouses, but Burns declines to do that. Instead, he relies on the premise that “more controversial is better.” He proffers this under-reasoned exhortation with a degree of self-righteousness that would embarrass even his ideological adversaries. Pagels’s readers should think through her scholarship and learn from her insights without the intrusion of under-informed, self-important journalist-oracles. What can be said about digressive blogging more than what Jeff Ward has so eloquently said? Well, a lot–partly because that’s the nature of digression, and partly because Shelley (once, twice) and Jonathan and probably others whom I’m forgetting to acknowledge have expatiated on the theme so helpfully. I’m probably inclined toward the digressive side myself. My students readily point this out to me, and anyone who reads this blog will realize that I don’t know the meaning of short-form. Well, it’s Evanston, to be precise, but it’s home and Robert Johnson never wrote about Evanston. Uneventful travel, except I’m exhausted and a couple of days behind. My talk in St. Louis went very well. I was acquainted with a number of people from the Church of St. Michael and St. George from when I preached there last year at the Easter Vigil, and from when I preached at Church of the Atonement, Fish Creek, Wisconsin last summer (at the invitation of Jean Pennington and her daughter Tracy, from CSMSG). What’s more, my uncle-in-law Roy Pennington (no relation to Jean) came over from Kirkwood, and Alyssa Cornell (who was a friend of Margaret’s back in school days) is a member of the congregation—so in all, it felt surprisingly like home away from home. The talk itself went well, so far as I can tell. People seemed to be listening well, the questions were good, and Phoebe Pettingill (Communications Director) said they received some positive phone calls the next morning. But it’s good to get back home, to be with Margaret and Pippa again, to receive reports from Si and Nate, and to confront the backlog of mail, teaching, and administrative tasks. Come to think of it, maybe I should just have brought Margaret and Pip down to St. Louis. A lot of talking about faith and spirituality online this week, and of course I welcome that. The topic presents tremendous challenges, since it seems to represent one of the top two or three most heartfelt topics for the people who write about it. If I (or anyone) were to question an online compadre about her or his spirituality, we would risk giving the impression of passing judgment on that correspondent’s whole identity. That being the case, I wonder whether my online friends would suggest that one cannot wrong about spirituality, or whether some things are quite out. The Taliban gets lots of bad press, but they clearly represent a vigorous, popular spiritual ideology; can we say that Wahhabi Muslims are spiritually wrong? On my limited understanding of Wahhabi Islam—the prevalent form of Islam in Saudi Arabia, and the basis for the Taliban’s and Osama’s theology—adherents are at least nominally committed to the elimination of other forms of Islam, but few Muslims seem inclined to act on that premise. On what basis would we assess the legitimacy of Wahhabism, or (to choose an even less ambiguous phenomenon) the People’s Temple or Heaven’s Gate groups? If all paths are one, or all lead to the same goal, do these count as “all-one” paths? Many people operate with an intuitive criterion of “all faiths that I see as more-or-less benign” counting as legitimate, while faiths or ideologies that explicitly, deliberately aim at destruction or oppression don’t count as “faiths” or as “pointing toward the One goal.” But I’m curious about whether we can give a more robust criterion for accounting for which count as benign and which don’t. If we can, it would help everyone, I think, to find out about it. If not, isn’t our talk about “all one” or “all the same” or “different paths, same goal” conceptually confused to a dangerous degree, inasmuch as such rhetoric allows us to claim that we are talking about “all” paths without accounting for the ones we may be excluding? Since my reluctance to use strong language has become a topic for some amusement, I will confess to you all that just a moment ago, when WordPerfect quit in the middle of my editing my newly-revised, started-over-fresh talk for tonight, I cut loose with a vivid and emphatic one. RageBoy would be proud. Having written out a complete draft of the talk I’m going to give tonight, I woke up this morning at 5:00 with a different, more satisfactory notion of how to say what I wanted to get at. The church invited me for a series entitled, “Who was Jesus and Why Does It Matter?” Yesterday’s draft involved following through the ways that Jesus makes life and theology more complicated (on one hand) and more simple (on the other). This morning, I realized that I could make most of the points I need to make by changing the exposition to an overview of Matthew”s christology, Paul’s christology, and the ways they intertwine and strengthen one another. What I really want to talk about, of course, is the kinds of conversations a hyperlinked priest gets into when the topic of theology comes up in the blogworld. I almost fired off emails to you who have taken up the topic with me, asking for permission to quote you in the lecture—but then I doubted I’d hear back from you on time, and I wasn’t sure it would turn out to be close enough to what the church asked for. Off to St. Louis, then, this afternoon—I’ll blog back tomorrow. I have too much to say on all these topics, too much to say. A number of sharerers in bloggery have unveiled deep feelings, and others old hurts with which I’m complicit, at least by association. Especially when the questions are so general, I’m likely to trouble others if I simply (re)state what I have learned on these subjects, with which most of our friends are to some extent already acquainted. Perhaps I can best disarm my pretentiousness and avoid wounding dear colleagues if I simply say that I don’t have the wisdom to claim that any other faith is the same as that which I confess, or that any other faith leads where I’m laboring to get. I don’t know how I would be able to tell. I try my best to go where I’m called, and to help neighbors along the route that looks right to me. 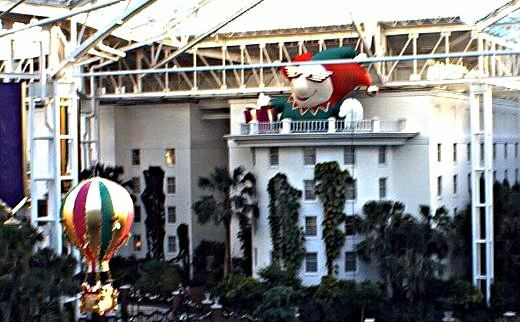 Yes, that’s a giant jester/Big Brother staring down at you from the balcony of one of the hotels. If that’s not scary enough, I could post the photo I have of the bottle of water they generously supply to your room, then charge $4 if you open. Heartfelt thanks to wood s lot for bringing us a daily serving of mind food. I was especially nourished by the Manuel DeLanda and the Olympic beer riot essays–but you bring us more good thinking than I can begin to digest. Well, I suppose “here” is the only answer to the first question, although the topic already figures obliquely in most of what I write. I say “obliquely” because biblical scholars have fought such fierce battles over the legitimacy of interpretations grounded in (secular) historical reasoning that one can hardly take up the subject directly without seeming to advocate an already-established party line. The problems that arise from simply accepting these given pictures of interpretation-from-faith and interpretation-from-secularity provoke much of my absorption in postmodern theory. If you read my various essays as attempts to dismantle the siegeworks that separate “secular” from “theological” interpretations, with each side boosting its own legitimate practices and assailing the other’s biased or corrupted practices, you will get a rough picture of how I’d answer the question. But David followed up with the second query, so I’ll try to give a brief account of an explicit answer here. Unhelpful response: Sure; people do it all the time, from casual skimming by disengaged browsers to exquisitely nuanced close readings. To take one example, Robert Alter (though firmly Judaic) offers literary interpretations of the Bible that one need not share his faith in order to appreciate. And as I suggested Saturday, the whole academic discipline of “biblical studies” operates on the principle that anyone who’s read enough, thought enough, and paid close enough attention to the text and its historical context ought to be able to participate in the discussion of the Bible. The Journal of Biblical Literature and Novum Testamentum are not addressed to believers, but to interested scholars. I suspect, though, that that doesn’t get to the dimension of the question that motivated David to ask. David’s question echoes a theme sounded very forcefully by critics like Matthew Arnold (who argued that we ought to read the Bible as we would any other book) and C. S. Lewis (who argued that one can’t really read the Bible as any other book, that a reader’s denial of the Bible’s foregrounded tenets amounts to a resistance to the book itself) and Erich Auerbach (who in celebrated chapters of his book Mimesis suggested that the biblical narratives distinguish themselves from other contemporary literature in the very texture of their literary composition. (Dave Rogers, the “Connect & Empower” Dave Rogers, suggests as good reads the anthology Incarnation edited by Alfred Corn, and Larry Woiwode’s interpretation of the Book of Acts [out of print]; I add, for symmetry’s sake, the book Congregation edited by David Rosenberg [also out of print], which was the Old-Testament precedent that sired Incarnation as its New-Testament offspring.) Can one, as it were, really read the Bible apart from some sort of “faithful commitment”? I mean, really read it? That question I dare not answer. It presumes that I could somehow escape my own experiences (which embrace both apart-from-faith and faith-full readings) to evaluate the authenticity (!) of another soul’s reading of the Bible. At the same time, I will say that there’s something about the interplay of living faith with attentive reading that fecundates provocative, stimulating interpretations. These are possible apart from faith, and heaven knows that faith in itself doesn’t engender interesting biblical interpretation, but when a deep reverence combines with literacy and sensitivity, then something special, something different and precious is liable to happen. Can one read the Bible apart from a faithful commitment? Yes, indeed. Does being a committed Jew, or Christian, or something-else make one ipso facto a better, more reliable, privileged reader? No, not a bit. May someone who deeply loves the material and subject of the Bible read the Bible with a sympathy and sensitivity that someone less committed might not be able to muster? That seems plausible to me. Does that mean everyone has to listen to what I say? I hope that no one is so foolish as to think so. While I’ve been trying to keep the theological content of this blog a seasoning—rather than a main course—a number of correspondents have acknowledged my voice among you all exactly as a theological presence. Your gift of patient attention and appreciation touches and, in a way, surprises me. I’m listening, and I’ll try to honor the complexity of speaking to your hearts from my own, with all our differences and shared interests. Thank you and, if I may say so, God bless you. I ought first to acknowledge that Tom said complimentary things about me, thus compromising my painstakingly-cultivated objectivity. (But I’ve given up Proof-of-Objectivity exercises — RageBoy wore me out.) In short, though, I think this probably does fine. It would be fun, though, to split more hairs on this later. RageBoy, not one to permit a bluff lightly, has put his postmodern theological cards on the table and even challenged me to show what I’m holding. I had been playing these close to the chest because (a) experience teaches that very few people in the world actually want to talk about theology and (b) those who do often want to explain how they figured out what life, the universe, and everything were all about and (c) they’re usually painfully shallow and (d) when they’re not shallow I’m embarrassed that I figured they would be and (e) it’s a topic about which I get even more excited than I do about things like voice, authenticity, community, and so on — and you’ve seen what disastrous consequences come from my getting excited about those topics. But having been dared to reveal what I wear under my cassock, I will acknowledge that I’ve read some (not all) Mark C. Taylor (and what many readers won’t know is that there are more “Mark Taylor”s in the theological world than you can shake a blackboard pointer at: Mark C. Taylor, Mark Lloyd Taylor, and my former colleague Mark Lewis Taylor, to start with). Though the umbrella labelled “postmodern theology” probably looks pretty small when you’re not underneath it, for those whom it covers the umbrella provides more than enough space for some pretty significant divergences. For instance, Mark Taylor (the “C.” one) talks about theology and a/theology, but most of his time he plays in the sandbox identified within the discipline as “religious studies.” “Religious studies” tends to treat “religion” as a general category (Christianity, Buddhism, cargo cults, Islam, fundamentalism as a cross-religious category, things like that). Religious Studies gives people a place to study and talk about religion and theological topics without the potentially awkward obligation to believe anything in particular. Within this group, Taylor is a brilliant and subtle scholar — but this is not the sandbox I play in, nor do I particularly care to work with the religious-studies ideology on its own terms. That’s okay; they do their thing, and I do mine. One of the other possible sandboxes is (and here I continue oversimplifying to an extreme) the “theology” sandbox, within which one plays when one says “I’m a Christian (or, less often but quite interestingly, “a Jew,” “a Muslim,” “a Buddhist”) and here’s how I puzzle out all the confusing and complicated stuff that my tradition and I claim to be true.” This is probably the sandbox within which I’m most comfortable, but for odd reasons it’s not my home. Another sandbox is the “biblical studies” sandbox, which is where my training and job description locate me. “Biblical studies” differs from “theology” inasmuch as “biblical studies” (which I will not abbreviate to initials, for obvious reasons) is another sandbox where one may play without owning up to believing any one thing rather than another. Many people, I dare say most people, who play in biblical studies are adherents of a variety of Christianity or Judaism; but non-adherents are welcome to the discussion, and that’s part of the self-definition of the sandbox. I eschew the temptation to talk about the peculiarities of these divisions, or the strengths or weaknesses of particular versions of the sandboxes. What matters relative to Rageboy’s instigation to talk this talk is that I entered the “postmodern” discourses by way of biblical interpretation, in deed by way of literary interpretation. I was flummoxed by how staggeringly boring most books about the Bible were, and I sought an understanding of interpretation that might help me both figure out why biblical interpreters wrote boring books and articles, and avoid tedium myself. The explanations that clarified matters for me came from courses I took on literary theory and postmodernism. Derrida, Foucault, and Lyotard, Fish and Rorty, and eventually people like de Certeau and Irigaray put ideas into my head that interbred and mutated (with the maieutic intervention of beloved friends), and brought me to the theological position from which I teach and preach today. That position is probably closest to the kinds of writings associated Radical Orthodoxy , a sort of politically progressive, theologically traditional, philosophically postmodern guacamole: spicy, tasty, rich, and great with tortilla chips. I got acquainted with John Milbank in grad school, where some of us sat around reading the early drafts that became Theology and Social Theory . Neighbors of mine have written Divine Economy , These Three Are One , Torture and Eucharist , Engaging Scripture , and Beyond Sectarianism . After all this time, to believe in Jesus…. Bad enough to indulge in cutesy-wootsy circumlocution (which I was about to delete this morning, having had an acute attack of good taste)–but then David Weinberger has to notice and, worse still, blog it. One of the useful functions of writing in public lies in its propensity to increase one’s humility. Actually, this gets back to the parrhesia, blogthread from a few weeks ago and the Web-personae blogthread as well. Let’s recognize in the radically anarchic domain of Hyperlinxia a situation where folks can speak as they want and then live with the consequences, without trying to police the conversations bloggers fall into.